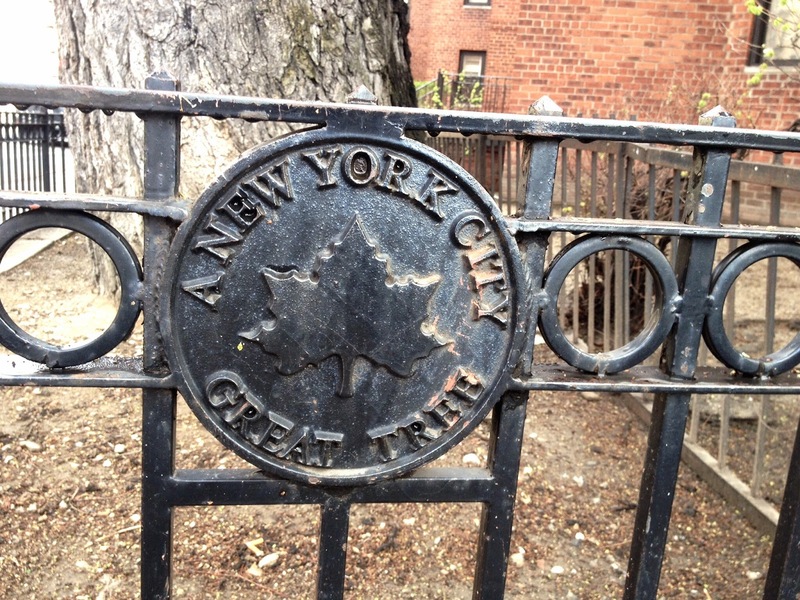 Nothing in New York City is old. Compared to other places almost everything we encounter in the city is new. A friend in England once told me that she and her husband were buying an old house. I'm thinking she's talking about a house that's a hundred years old and has fix-up issues. The house she was referring to was from the 1600's. 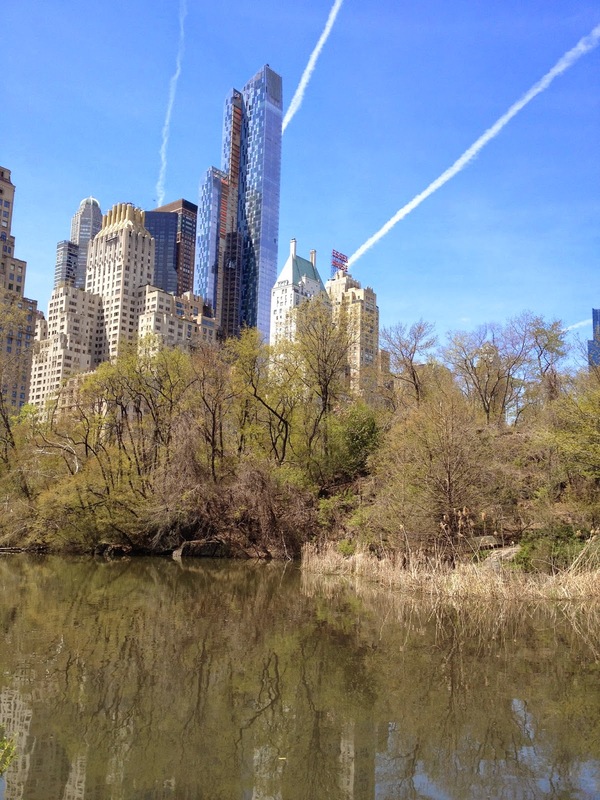 Is there anything that old in the city other than the rocks in Central Park? 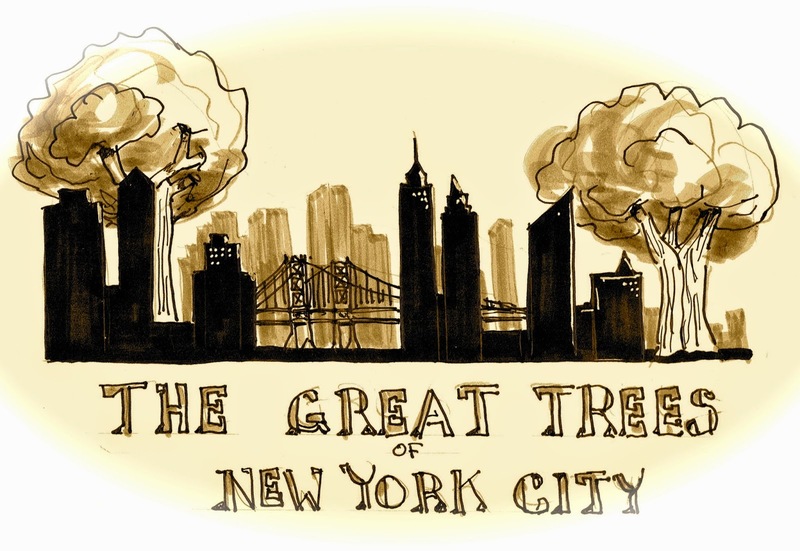 As these things go the Great Trees of NYC are old. The Dinosaur on 163 St and St Nicholas Avenue dwarfs anything you'd normally see. It's incongruous standing amidst parking meters, small groceries stores and people walking in the early morning sunshine. 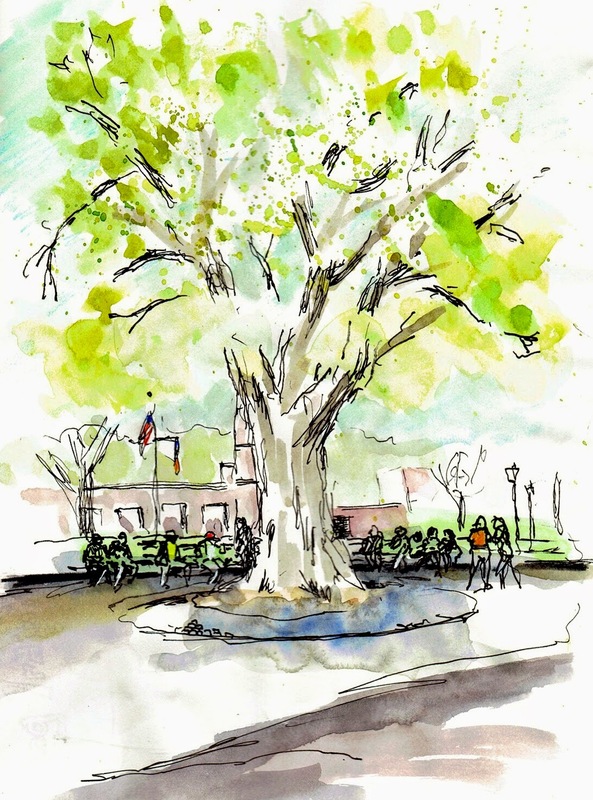 The English Elm was alive when Washington stood underneath. It was alive, and so was he. 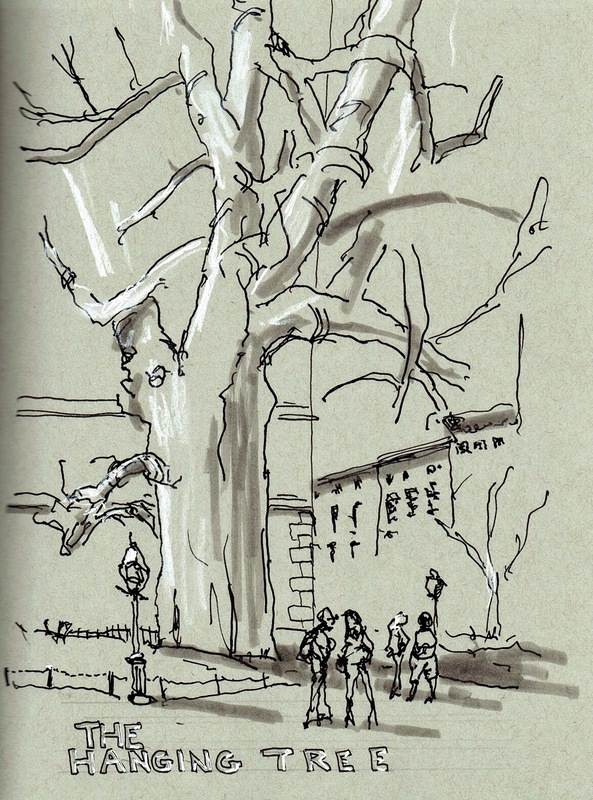 At least two dozen people stopped to chat with us as we sketched. What a wonderful friendly neighborhood. I think our interest in their neighborhood tree made them stop to look in wonder at something they must pass everyday. 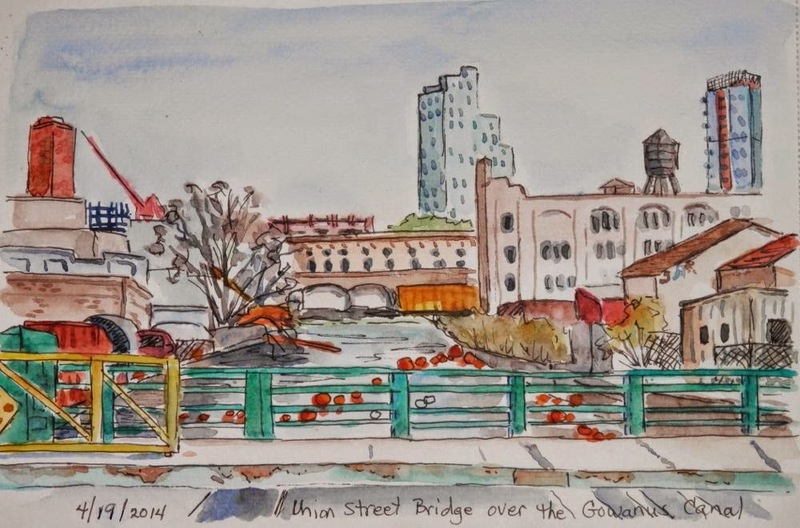 Isn't that what Urban Sketching is about? 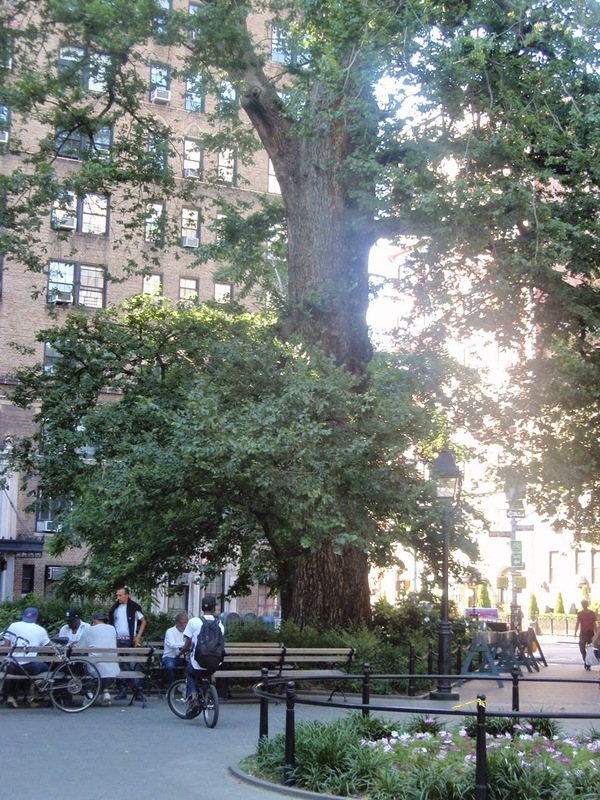 Washington Square Park is filled with old stately trees, but none was as old or as stately as The Hanging Tree. 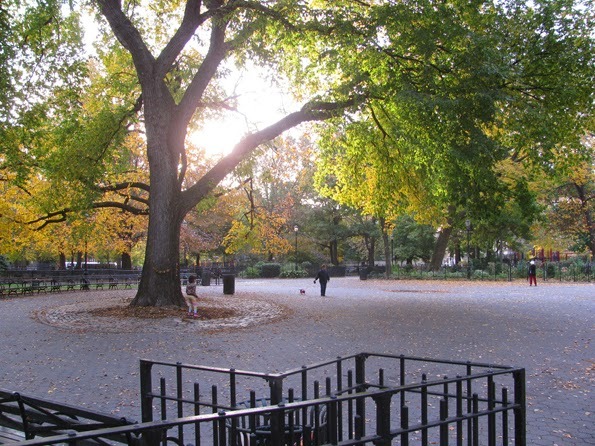 The Hare Krishna Tree in Tompkins Square Park was less obvious than the other two trees. It's in the middle of the park and nothing indicates that this particular tree has a story. 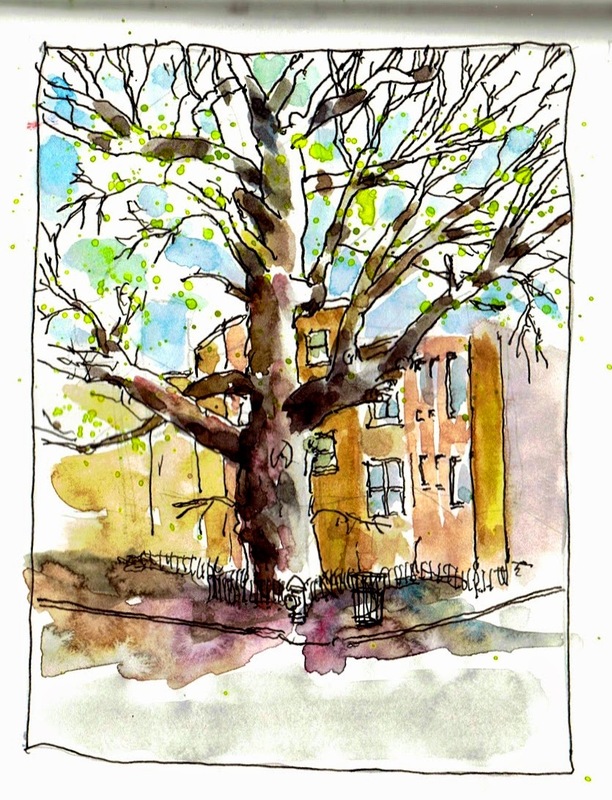 It might be slightly taller or somewhat older than the other trees, but it's not a dramatic or obvious thing. We asked several people from the Park Department and they had never heard of the tree. The strategy that helped us find the tree was some empathic detective work. Asking the question, if you intended to address several hundred people, who would sit and listen, and then chant and eventually get up and dance, ... what tree would you pick? Then the choice became obvious. Confirmation came in the form of a tiny parks department sign 30' up that said - Hare Krishna Tree. We debarked at the Ikea facility which is located on the Erie Basin in Upper New York Harbor. Remnants of the wharf infrastructure are preserved there, including cranes, winches and bollards. abandoned lot we got a view up the length of the canal which was a perfect place to start sketching. Conservancy for hosting our visit to the Canal. 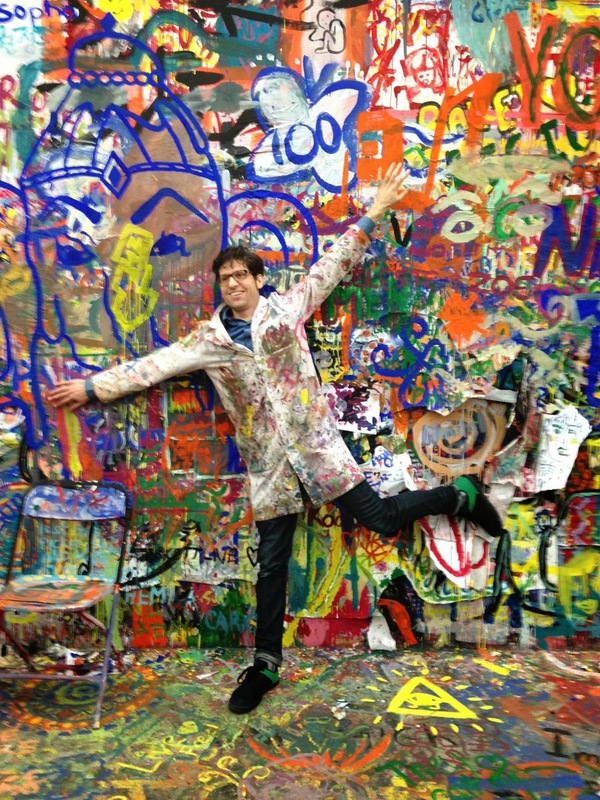 Last Friday night, I skipped out of work (I was so excited, I ran, actually) to join with fellow Urban Sketchers in this collaborative project by Polish artist, Pawel Althamer. 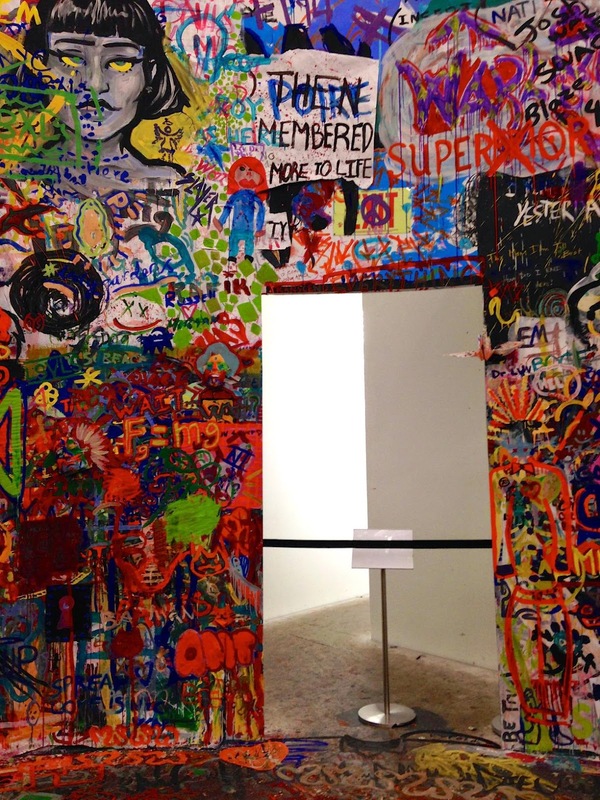 Located on the Bowery, in the New Museum's fourth floor gallery, the installation transforms daily, as group after group of visitors come make their marks here, be it the walls or the floors or the tepee in the middle of the room or right over someone else's existing creation. Jason and Mark were at the opening when the walls were all white. Now look! Jason modelling the lab coat/butcher's frock/smock provided for all guests. 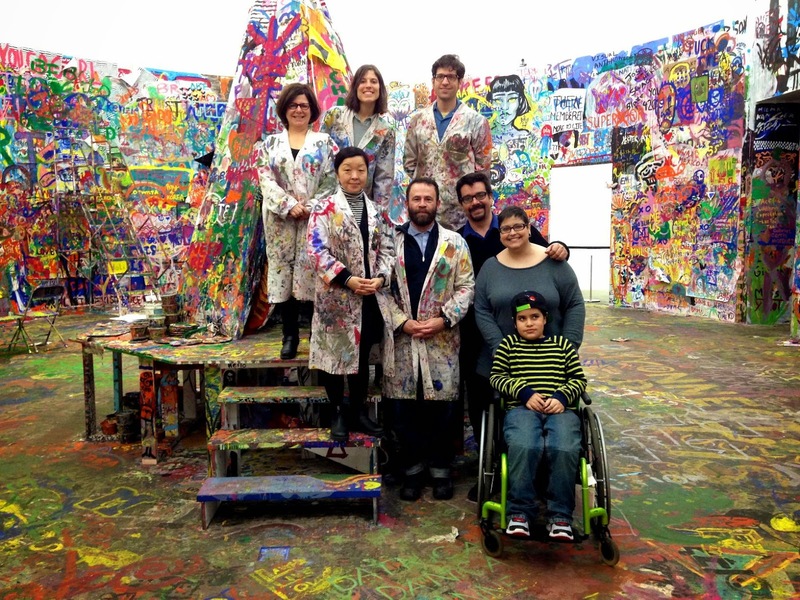 Everything in this room is covered in paint. And I do mean everything. Hmmm... the hallway in the adjoining hall, though, is looking mighty pale. 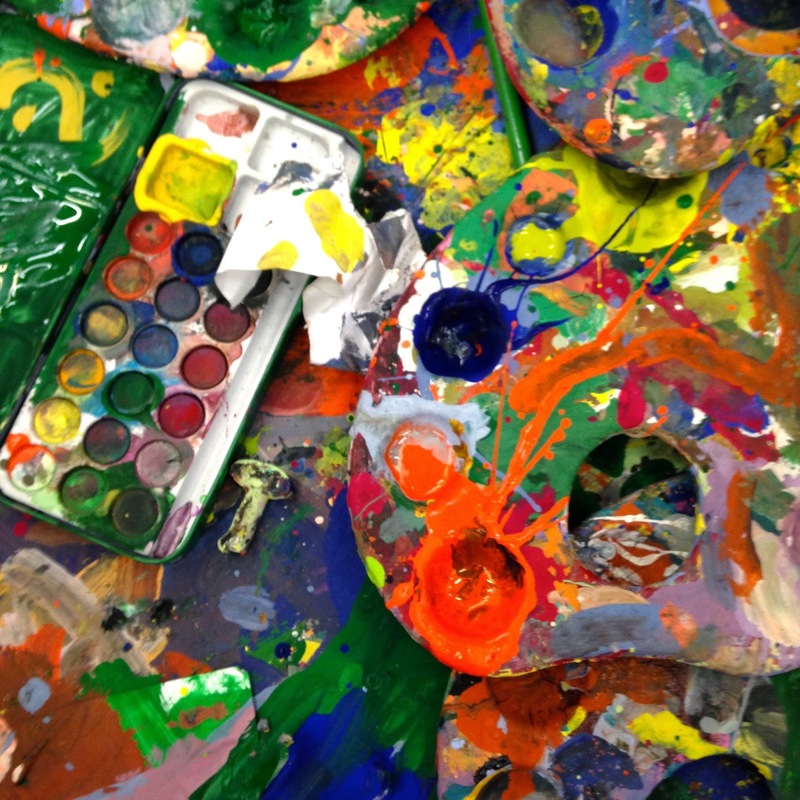 Juicy colored tempera and watercolors, and brushes in every size. Just like kindergarten. Not a bad way to bond. 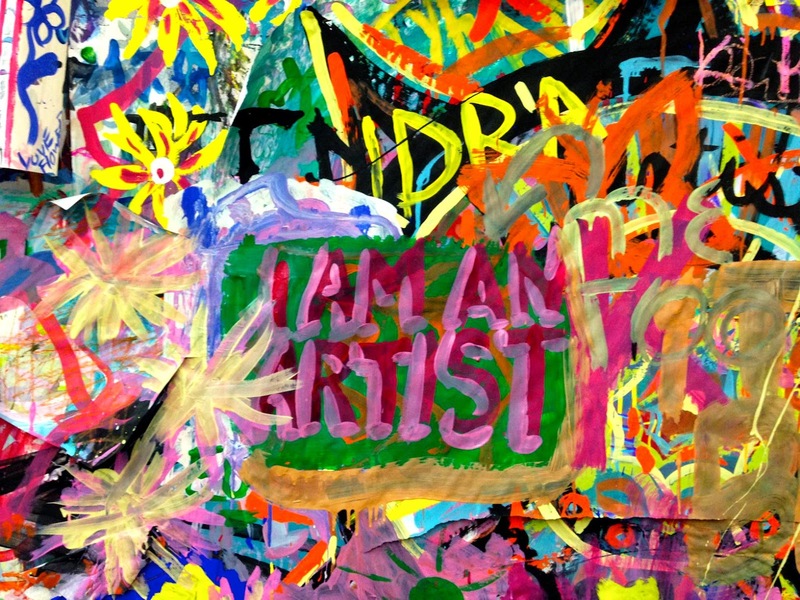 Moments after I painted this affirmation, other artists came along and added to it. Marie-Laure about to get splashy. After sketching a lovely design, Marie-Laure invited me to splash over it. Here, nothing is sacred. A distorted panorama shot--but you can see the teepee in the middle. Thanks, Richard, for organizing this outing. 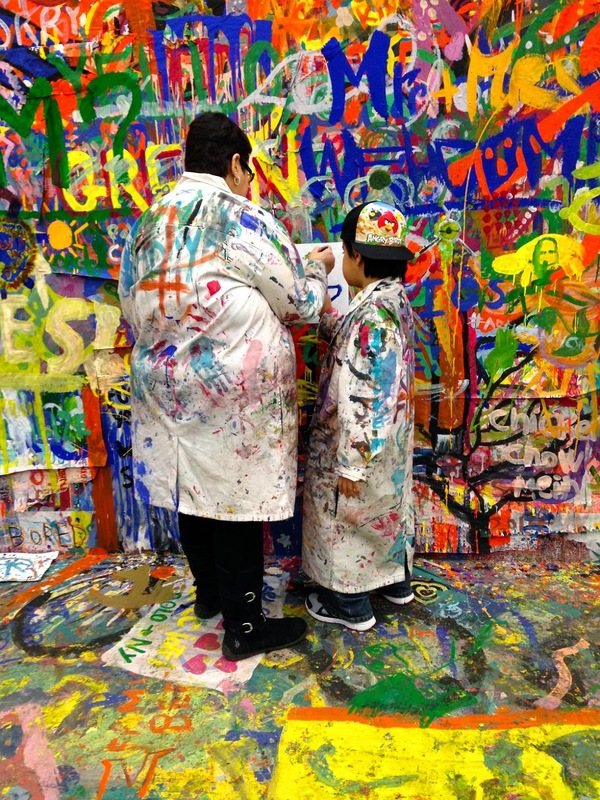 Oh, and this Wednesday through Sunday (April 23-27), they will be disassembling this exhibit during the museum’s public hours and the painted walls will be cut up and distributed to visitors for free. The first stop of the day was on one of the drawbridges overlooking the canal. A decaying motorboat and shipping containers , another bridge, the elevated highway and the Kentile sign, as well as a construction crane were alll cramned into my first sketch. 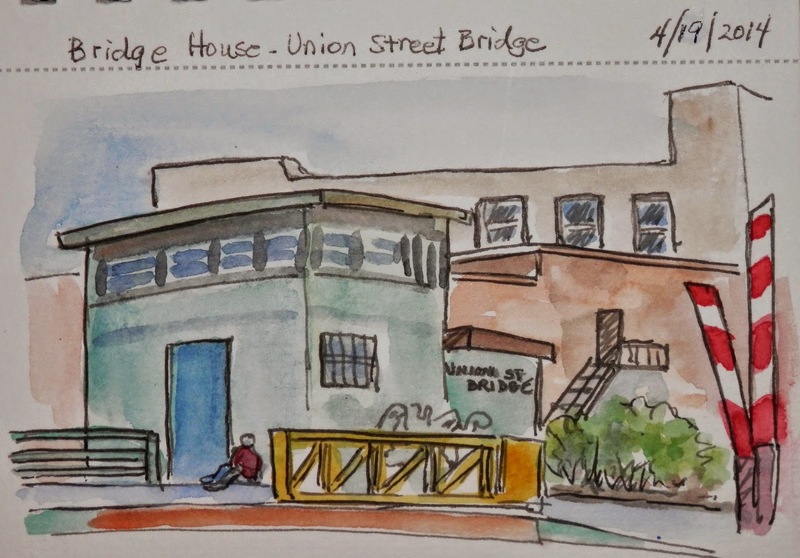 It was a busy two days of NYC Urban Sketcher activities. 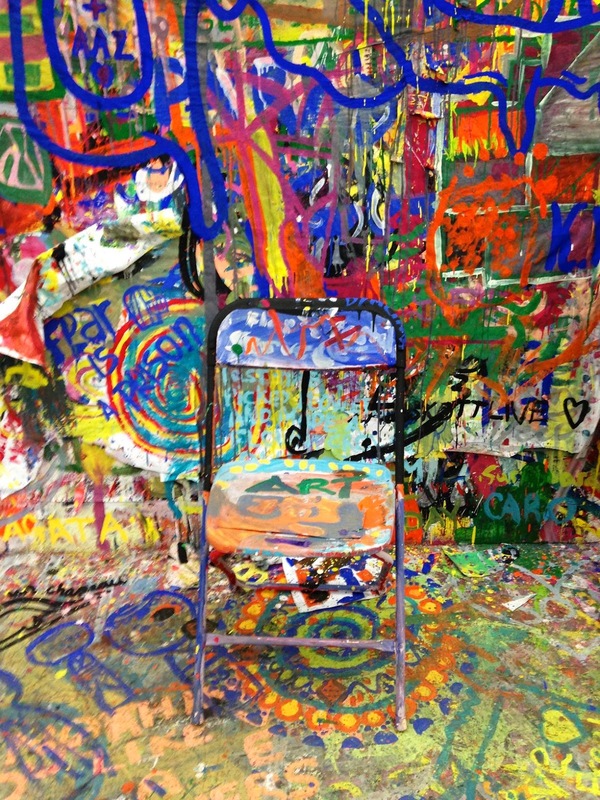 Friday was the Draftsmen's Congress where a group went to the New Museum to be part of a larger group drawing. 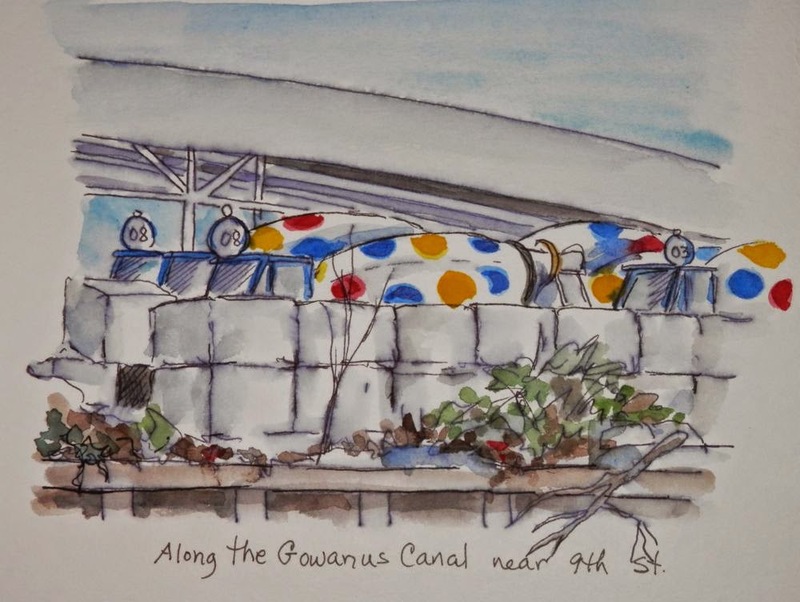 Saturday was the 43rd Worldwide Sketch crawl through the Gowanus Canal and Long Island City and the turnout was quite large. 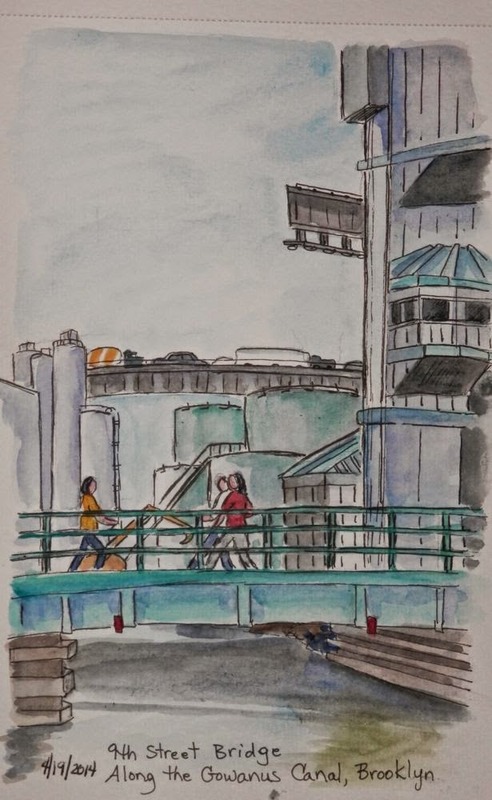 Check out the blog for more Sketcher posts. What a great day. We started at Wall Street and took a ferry ride to Red Hook section of Brooklyn. We stayed at the ferry terminal for awhile waiting for late arrivals. 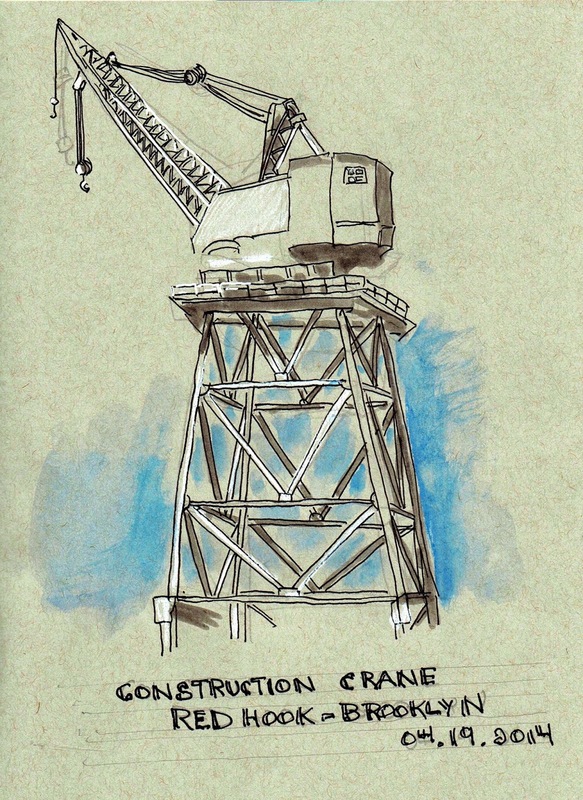 Even as the boat was pulling into the Brooklyn slip I spotted a crane that I wanted to sketch. The complexity of the girders was fun. I also enjoyed highlighting the closer steel beams with white and shading the rear beams gray to support the three dimensionality of the crane. 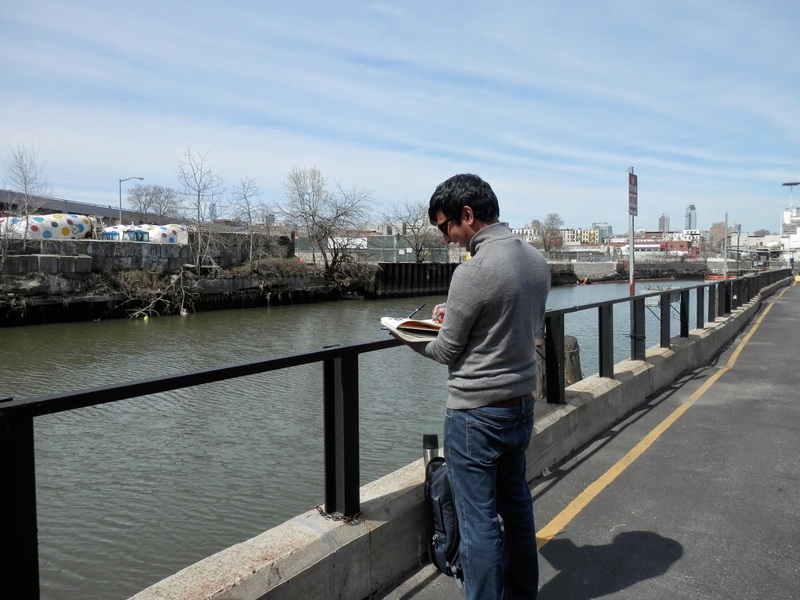 We met-up with five people involved with the ecology of the Gowanus Canal, a 19th Century commercial waterway that has been incredibly polluted for centuries. They were part of the group who, for years, have been working to cleanup the canal. 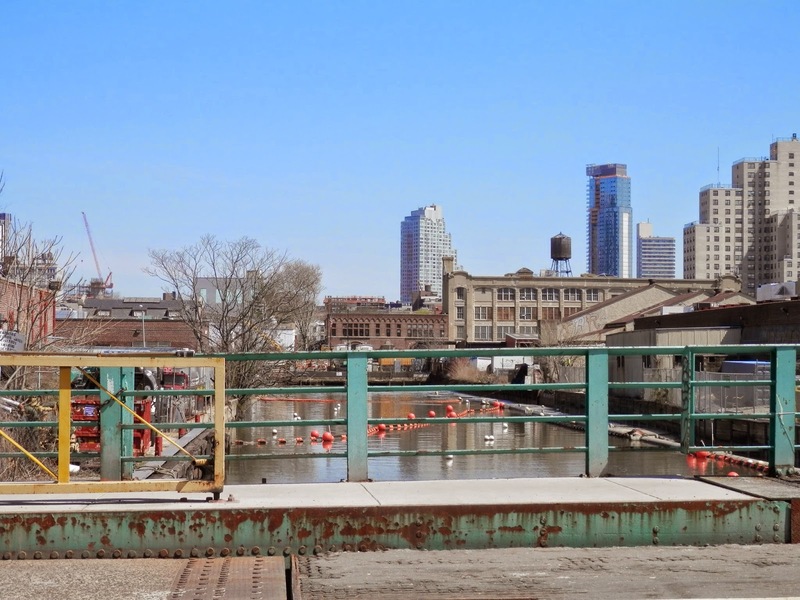 Growing up in Brooklyn I have memories of how toxic and awful the canal was and can appreciate the progress they've made. It's hard to be there without thinking how truly beautiful the canal could be. Everyone loves water and an inland waterway could be a tremendous attraction. Several of the volunteers are Landscape Architects. As a general rule I've observed that Landscape Architects are all frustrated sketchers. 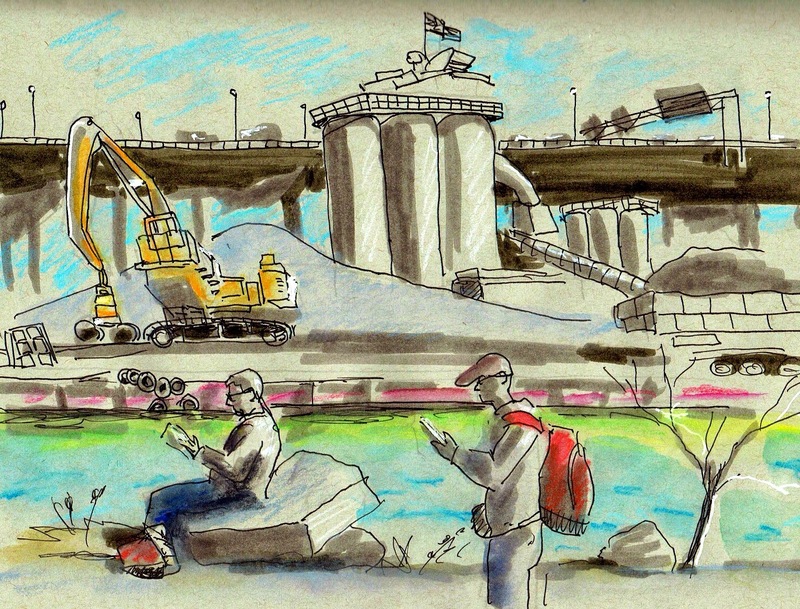 They are easy recruits for the pleasures of Urban Sketching. They showed us a secret path to a great view of an Asphalt Plant across the waterway. 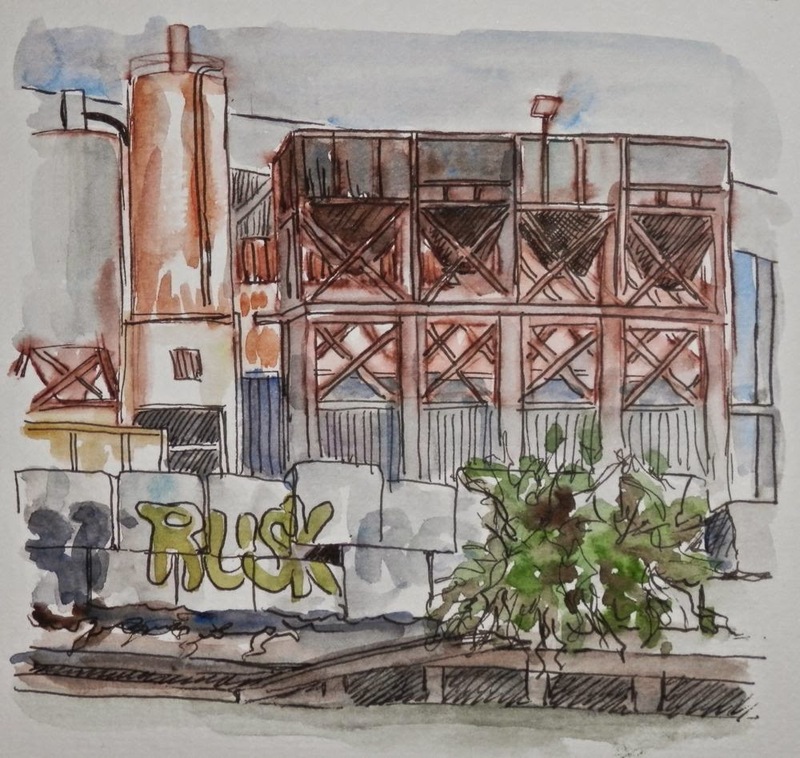 Not the Urban view I would naturally be drawn to, but I loved sketching the area. The weather was near perfect and the company, as usual, was great.